Bunyonyi safari resort located in western Uganda in the district of kabale is beautiful resort which offers world class accommodation services and facilities in a countryside setting. The Resort which is locally operated and owned provides visitors who are on their Safaris to Uganda an opportunity to enjoy the local Ugandan life as well as enjoying the world class services and amenities offered in the Resort. The most appreciate way of enjoying Uganda safaris is by staying in the Bunyonyi Safari Resort which is located in heart of the Uganda’s beautiful lake Bunyonyi and also the Resort is near Uganda’s protected areas with rare species of the Mountain gorillas and this explains that visitors who are on Safaris in Uganda should stay in this strategically located resort because they have maximum chances to enjoy the natural beauty of Uganda’s lakes as well trekking the world unique species of gorillas in the country’s endowed national parks. Bunyonyi Safari Resort can be accessed by all travellers on Uganda safari with Bunyonyi encounter on their package. 437km from Kampala, Lake Bunyonyi lies in the middle of Kigezi Highlands and from Rwanda’s Capital Kigali which is only 127km. Uganda Safaris organize for travellers in Uganda to spend their nights in the Bunyonyi Safari resort cottages which have occupancy of 12 bed and the mainly hotel complex having occupancy of 92 beds as well as 2 luxury suites. Spending your night in this wonder full facility will enable client to enjoy the accommodation well-furnished self –contained rooms which are built in the way that they provide maximum comfort to the client. The most interesting part of the Resort is that it prepares mainly African Delicious Cuisine and this offers the visitors to have experience of African delious traditional Cuisines but also the experienced chef in the hotel can prepare all international dishes and this offers visitors chance to enjoy their own cuisines yet in African land. Our cuisine is mostly African. While at the Resort, visitors on safari in Uganda can take a walk to the hill top above Bunyonyi Safari Resort were the conference hall of the hotel is located and while at this places visitors are guaranteed with fresh Breathtaking. 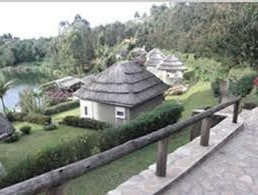 Besides all that mentioned while on this hill top visitor can enjoy panoramic view of the Lake Bunyonyi as well as Muhavura volcanoes and also the local homesteads of the local communities. The beautiful Bunyonyi Safari Resort is the best place where travellers who wish to travel together with the family members can spend their holiday from and also offers opportunities for corporate retreats, group meetings as well as team building. The Resort offers visitors best escape place from the city hassle as well as family bustles and the most impressing it provides visitors with the best convenience and comfort of a modern world class accommodation facility.